If you can swing the $300+ price point of the Canon PowerShot SX260 HS, beginning and intermediate photographers will find quite a few nice options with this camera. The 20x optical zoom lens is a great feature, and color accuracy in images is very good. Response times are a little sluggish and low-light performance is mixed, but this is a very nice intermediate-level camera. Read more in our Full Conclusion. Canon continues to update their popular SX-series line of compact super-zooms, with the PowerShot SX260 HS being their most recent entry for the first half of 2012. This unit builds upon the SX230 HS from last year, with several upgrades. The most notable of these is the 20x optical zoom lens, which covers a 35mm equivalent zoom range of 25 - 500mm. It sports Canon's proven Optical Image Stabilization system, helping you capture sharper images when using its telephoto capabilities. They've also included their HS (High-Sensitivity) System in the SX260, which they boast helps the camera perform better in low-light situations. Smart Auto has received some enhancements too, now with 58 scenes and Face ID. Other impressive features include burst shooting at 10.3fps, and built-in GPS. 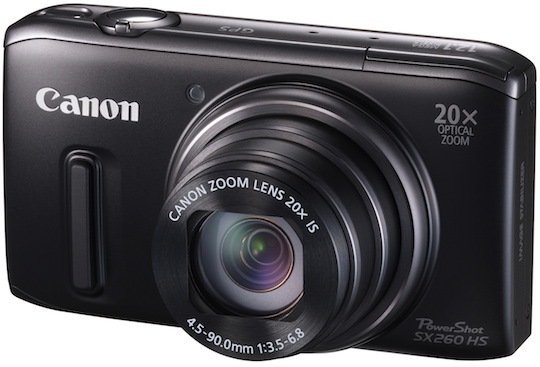 The Canon PowerShot SX260 HS is available now with a suggested retail price of $349.99 USD. See our buy box below for the most current online pricing at various well known retailers.